Parallax is a mesmerizing modern design with low profile etched opal glass counter-balanced by a large crystal ball accent. 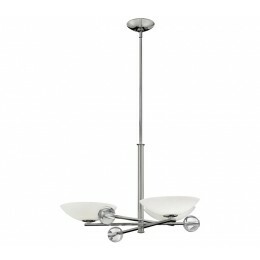 The sleek stem and arms in Polished Nickel, Vintage Bronze or Brushed Nickel add contemporary flair. 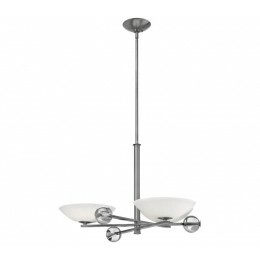 The Fredrick Ramond FR45923VBZ Parallax collection Chandelier Lighting in Vintage Bronze uses Halogen light output and brings Modern style. This item is 20"H x 34"W. The total wattage is 180 and the voltage is 120 volts. The Fredrick Ramond FR45923VBZ requires 3 bulbs (included). Additional Information: Shade-Etched Opal Glass.